Ikea delivery nightmare: The business rationale for subpar front-door service. It all started because I wanted the Nelson Swag Leg Desk. Not a new, licensed reproduction—I wanted the scuffed-up, 1960-vintage Nelson Swag Leg Desk I found on eBay. It seemed to me mostly irrelevant that I could not afford the Nelson Swag Leg Desk. But my husband suggested a budgetary adjustment: Instead of pairing the Nelson Swag Leg Desk with pricey custom-built bookshelves as planned, we could economize with a jumbo set of Ikea’s Billy bookcases, which fit the appointed space almost to the centimeter. At first, I resisted this financially expedient arranged marriage of a modern-design icon to a prosaic dorm-room staple that I associated with beer pong and Gustav Klimt’s The Kiss. Eventually, though, I started talking myself into the compromise. I tried to think of it as a chic high-low flourish, like Anna Wintour pairing couture with jeans on her first Vogue cover, or Mike D plonking a Target pouf smack in the middle of his otherwise ultra-customized Brooklyn townhouse. Or something. We completed the order, absorbing the blunt force of the flat $99 delivery fee. But the odyssey of the Billy bookcase, we discovered, had only just begun. June 7. We buy the bookcase. June 16. We receive an email from a company called UX Logistics stating that our order is ready to deliver. June 17. UX Logistics confirms via email that our delivery is set for June 21. June 21. Another email from Ikea, asking to confirm our order. June 21, Part II. UX Logistics confirms via email that our delivery is set for June 26. And on and on and on. Each afternoon, my husband would call UX Logistics, who’d say something like, “We can’t deliver your item because it hasn’t arrived,” then call Ikea, who’d say, “They do have it—you need to call them back and find out why they’re not delivering it,” and so forth. At one point, my husband asked Ikea to cancel the home delivery so we could arrange to pick up the bookcase ourselves. Easy for all concerned, right? Wrong: Ikea claimed that cancelation of the delivery was impossible, because the bookcase had already been delivered—to UX Logistics, who said they didn’t have it. Even if we canceled the order outright, Ikea told us, we’d be on the hook for the delivery to the delivery company who hadn’t yet received the delivery. 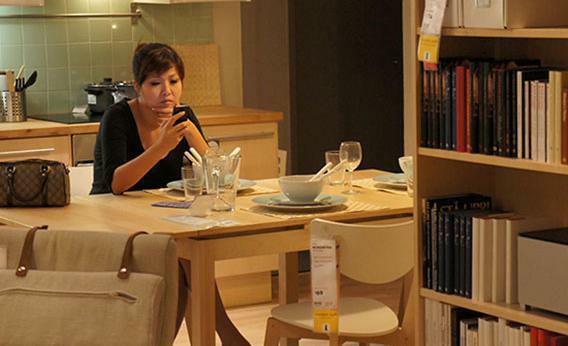 It turns out that Ikea is not just a furniture retailer. It is also an epistemological time machine, casting into doubt everything we thought we knew about semantics and the space-time continuum and the ding an sich of particle board. The nightmare of Ikea delivery is a truth so universally acknowledged that even the company cops to it. Chief marketing officer Leontyne Green talked about her own “very frustrating” Ikea delivery experience in a December 2011 Ad Age profile, which stressed the firm’s ongoing efforts to improve delivery and overall customer service. But as anyone who has found herself dissolving into the hypnotically well-appointed cattle chute of an Ikea showroom can tell you, this is not a company that does things by accident. The who’s-on-first shambles of Ikea delivery isn’t the flaw in the Eivor Cirkel rug. It’s instead a case study in how a large retailer can succeed by failing. Here are five reasons why. Ikea has no rational economic motive to offer halfway-decent delivery. Like many big-box retailers, Ikea outsources all its delivery. “With sporadic orders over a wide geographic area, Ikea would need a fleet of trucks that might be idle one day and not able to handle the load the next,” says Robert Shumsky, a professor of operations management at the Tuck School of Business at Dartmouth. Of course, other furniture retailers such as Crate and Barrel and Pottery Barn juggle similar logistical challenges, but have nothing like Ikea’s reputation for delivery debacles. Ikea may be OK with this because it doesn’t have much competition in the bargain furniture business—there’s no one else selling couches quite so cheap. The company sees its customers as fundamentally different: thriftier, for sure, but also stronger, more resourceful, stoic in the face of challenge! According to Santiago Gallino, also a professor at the Tuck School, “Ikea’s target customers are consumers who prize ‘value,’ and are willing to spend their own time to save money”—by pulling items from the warehouse, assembling the items themselves, etc. “Asking the customer to spend time to come to the store is consistent with this segmentation strategy,” Gallino says. Making you wait might make you happy. The longer we waited for Billy, it seems, the more we pined for Billy, which heightened our satisfaction when Billy did finally arrive. “The advantage of making people wait is that it creates a sense of anticipatory excitement,” says Michael Norton, a professor of marketing at Harvard Business School. Norton and Elizabeth Dunn’s recent book Happy Money makes the case that a pay-now-enjoy-later model of consumption leads to greater customer satisfaction than the enjoy-now-pay-later logic of, say, Amazon Prime. Or not. “Working as Ikea’s fulfillment and transport manager had no impact on my enjoyment of the shelves once they arrived,” my husband said in a statement to Slate. Without meaning to, I recently tested this last hypothesis at my local Ikea in Red Hook, Brooklyn. Shumsky had mentioned that he’d wanted to purchase a Spoka nightlight for his daughter, but Ikea doesn’t deliver this item and his nearest showroom is two and a half hours away. I’m only about five miles from mine, so after checking online that the Spoka was “most likely in stock” in Red Hook, I hopped on my bike to go buy one for him. But once I’d slowly wended through the endless floor displays to the lighting emporium, I couldn’t find the Spoka nightlight, or any nightlights at all, or anyone on the floor to help me find the nightlights, so I bought and ate an Ikea cinnamon bun and got back on my bike and rode home. I know that Ikea won’t lose any sleep over me and my failed nightlight quest (which cost them all of $15) or the Billy breakdown. But it’s still a little strange—a little analog, a little pre-Amazon and pre-Apple Store—to realize that a bad customer experience is part of the design of a good business strategy.